Over the last 100 years, the way we visualize and understand the complexity of the brain has evolved. Slideshow: Over the 100-year history of modern neuroscience, the way we think about the brain has evolved with the sophistication of the techniques available to study it. Improvements in microscope design and manufacture, together with the development of cell-staining techniques, afforded neuroscientists their first glimpse at the specialized cells that make up the nervous system. Microscopes with more magnifying power enabled them to probe nerve cells in greater detail, revealing distinct compartments. Newer techniques expose the connections between nerve cells, revealing the complex organization of the brain. 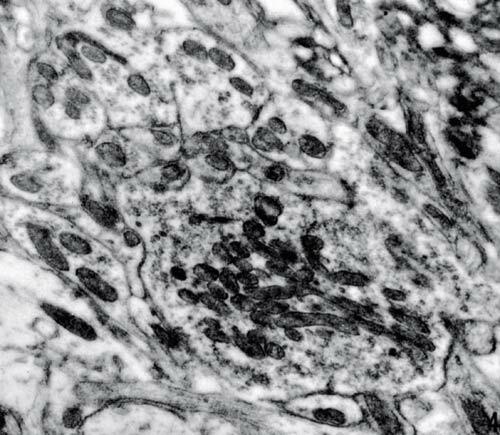 Nineteenth-century histologists created some of the first images of nerve cells by chemically stiffening tissue and then immersing it in silver nitrate, randomly staining a small number of cells to make them visible when they were viewed with powerful new light microscopes. The technique revealed the silhouette of the cell body and its network of extensions, and it enabled the great neuroanatomist Santiago Ramón y Cajal to prove that the nervous system consists of cells. 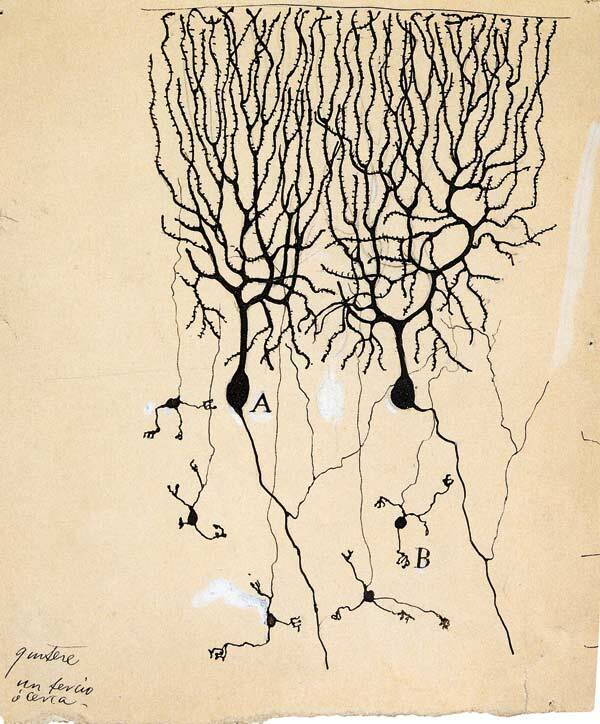 He produced the 1899 drawing at left: it shows finely branched Purkinje cells, large neurons in the cerebellum that play an important role in controlling movement. Slideshow: Fluorescent dyes can now be injected directly into cells to stain the ones a researcher wants to view. 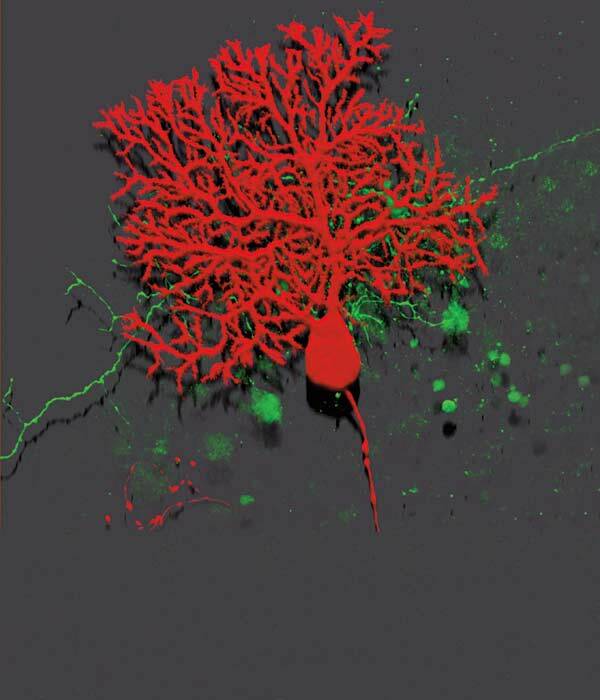 This image shows a Purkinje cell in red and a nerve fiber from another cell in green. 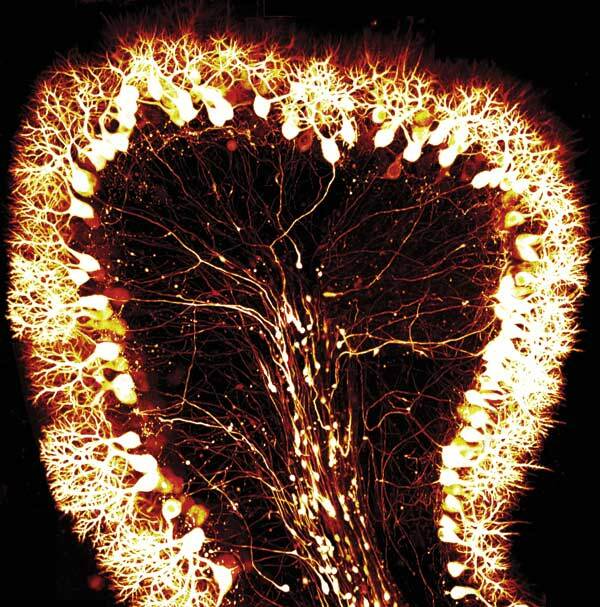 A single Purkinje cell is connected to hundreds of thousands of these fibers. Developed in the 1930s, electron microscopes illuminate tissue samples with beams of electrons rather than light, increasing the maximum resolution so that much smaller structures can be distinguished. The image above, of a part of the brain stem that processes auditory information, shows a cluster of nerve-cell connections, magnified 23,900 times. The small, faint circles are synaptic vesicles, which ferry chemical signals between cells. Slideshow: A newer twist on electron microscopy, developed in the 1980s, can reveal the internal structures of nerve cells. Researchers use a detergent to remove the cell membrane. Platinum and carbon are deposited onto the exposed surfaces to reproduce the cell’s interior features as a three-dimensional mold, which is then examined in the microscope. 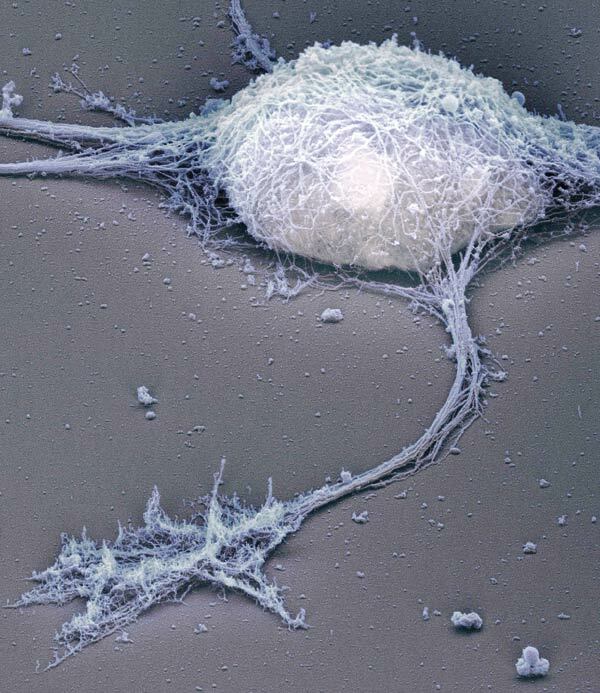 This image shows a hippocampal neuron that has been stripped of its membrane to expose the cytoskeleton, a scaffold that regulates the cell’s growth and movement. In the mid-1990s, researchers began marking specific cells in lab animals by genetically engineering the organisms to incorporate fluorescent proteins (above) found in marine species. Within 10 years, these proteins had been engineered into the cells in more complex ways, enabling researchers to monitor biochemical reactions and track the movements of cellular proteins in real time. Slideshow: Scientists can now label nerve cells in a rainbow of colors. 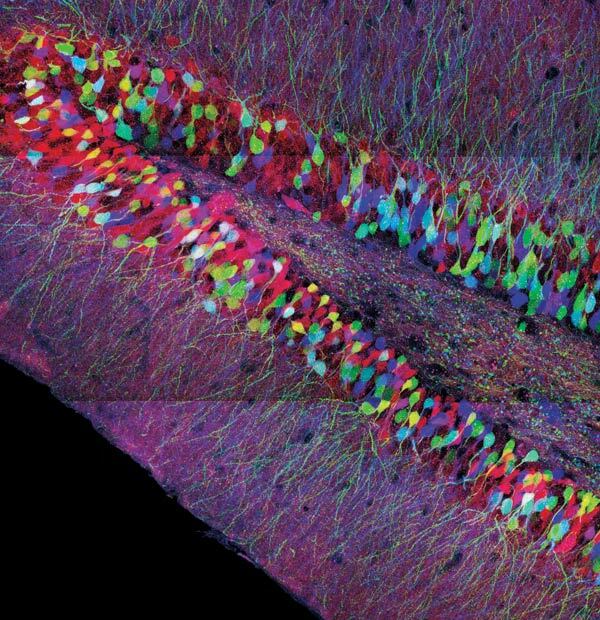 This image is of a “Brainbow” mouse, which has been engineered so that different nerve cells glow in dozens of hues; it shows the hippocampus, a brain area that is crucial for memory. This technology, developed in 2007, has revealed the connections between cells in remarkable detail. Confocal laser microscopy uses focused laser beams to scan tissue. The focused beam reduces the scattered light signal used in conventional microscopes, producing sharper, more detailed images. Light reflected back directly from each point is used to construct a three-dimensional image. 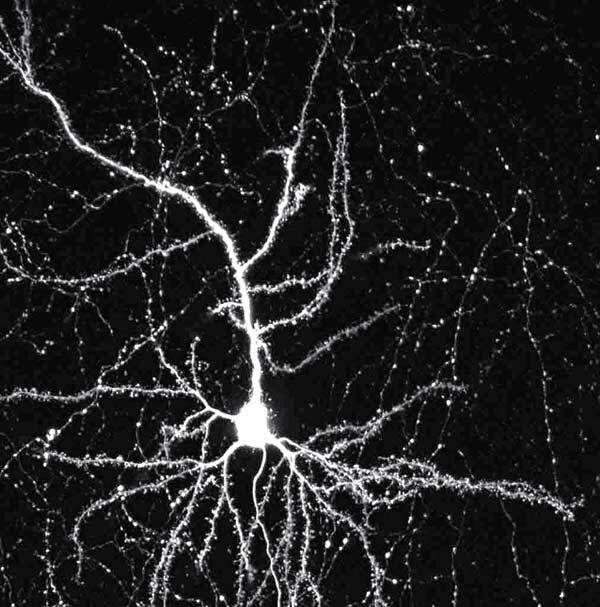 This pyramidal neuron from the cortex of a mouse (above) was visualized by scanning the tissue at different depths and superimposing the series of images. Slideshow: In the 1990s, scientists developed a way to further reduce the scatter of light, called two-photon microscopy. 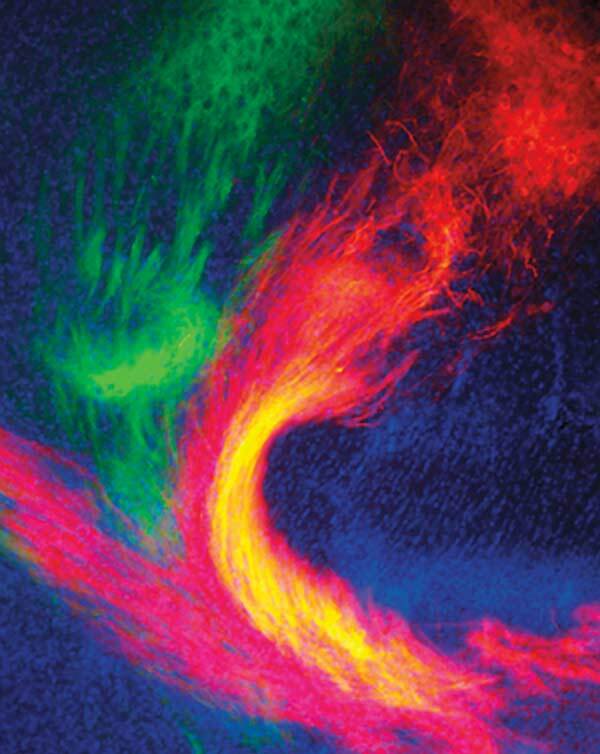 This approach, which uses infrared light, can probe deeper into live tissue, producing images like the section of mouse cerebellum shown above. In the 1980s, scientists developed fluorescent dyes to help them examine the long, thin extensions of neurons that carry information between these cells. Injected directly into the brain, the dye is incorporated into the cell membrane and transported along it, revealing the route of the nerve fiber. This image highlights the long-range connections between sensory areas of a mouse’s cerebral cortex and thalamus, often called the brain’s relay station. 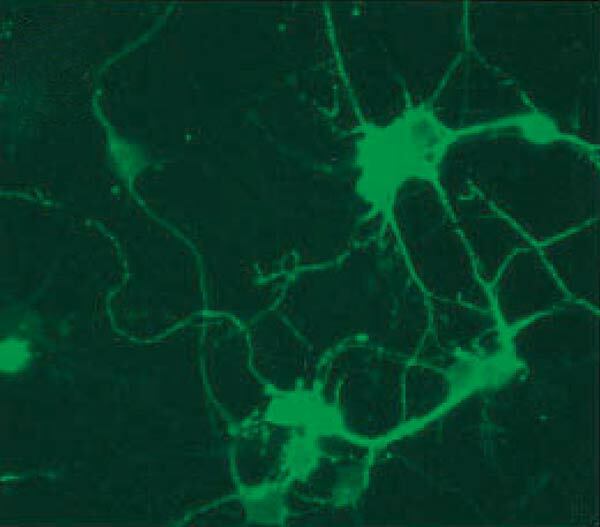 Fibers from the primary visual cortex are shown in red, while fibers from the primary somatosensory cortex, which processes bodily sensations, are shown in green. 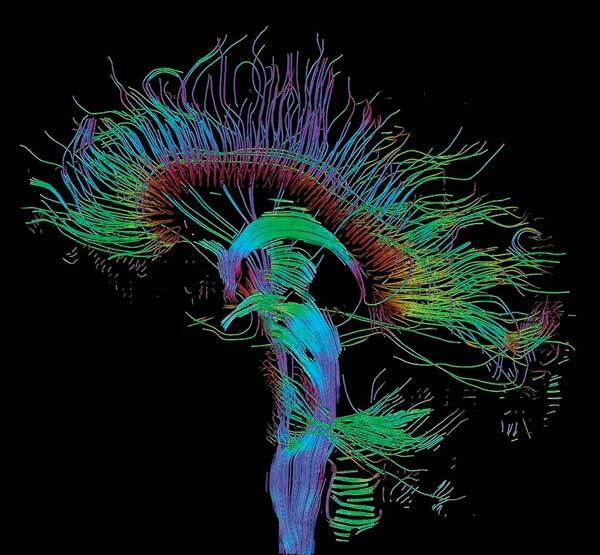 Slideshow: Today, scientists can safely examine these connections in a living human brain using a variation of magnetic resonance imaging (MRI) called diffusion tensor imaging. This technique, developed in the 1990s, infers the location of nerve fibers by tracking water molecules in the brain as they move along them. The image above shows fibers radiating from the thalamus in a human brain.